I’ve been trying to incorporate more tomatoes into my diet as they are rich in vitamin C and a good source of the powerful antioxidant lycopene which can reduce one’s risk for cancer. Tomatoes have the additional benefit of being delicious because of high levels of glutamic acid. Glutamic acid makes food savory in the same way flavor enhancers can like MSG. Tomatoes can be enjoyed when they are green and when they are ripe. The green tomatoes can be made into a salad with mint and chilies like in a Thai salad or fried Southern style when coated with cornmeal. Humans first cultivated the tomato out of small bitter winter berries on the coastal deserts of South America. The name comes from the Aztec word for plump fruit or “tomatl”. Tomatoes belong to the same species as the nightshade plant (e.g., mandrake) which is poisonous. The nightshade family includes the tomato, bell peppers, chilies, eggplant, and tobacco. The early European explorers took this new plant home in the 1700’s and its popularity took a long time develop as the lore of this poisonous plant thrived. For example, in places like Italy where the tomato was eventually accepted, it took several hundred years before it gradually was woven into the fabric of Italian cuisine. 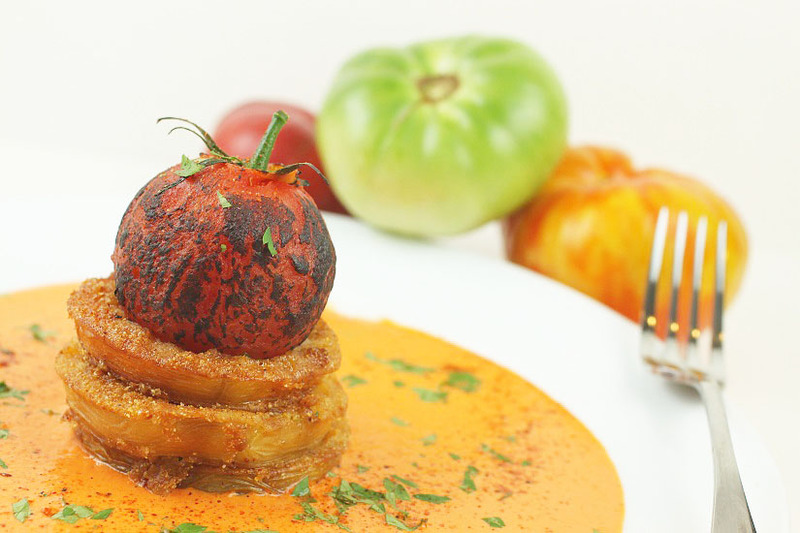 Today, Italian cuisine is synonymous with tomatoes but the reality is that tomatoes originated from South America. As in many cultures throughout the world, humans are extremely adaptable in creating new traditions with novel ingredients and over several generations, these ingredients become part of their cuisines. Another example is the spicy Schezuan cuisine in China based on a triad of Schezuan peppercorns, chilies, and pepper. Well, the chili and pepper actually did not originate in Schezuan as chili originated from South America and pepper was imported by traders from Southeast Asia. When Esther Webber, a good friend stopped by, she brought along a basketful of heirloom tomatoes from her backyard garden. These multicolored striated tomatoes had a late bloom in Northern California and yielded a richly textured fruit. If you can’t get a hold of heirloom tomatoes, beefsteak vine ripened or plum tomatoes are a good substitutes. When I serve it as a side dish, I like to dip it in some ranch dressing. If I do it as an appetizer, I prepare a tomato puree sauce like in the pictures. Ensure the oil is hot enough else your tomatoes will become soggy. Too hot and they will get too dark. Beat egg and mix in the buttermilk. Dip seasoned tomato slices into the egg wash and then into the flour mixture. Shake off excess. Repeat process again by dipping into the egg wash and then flour mixture. Shake off excess again. Place on wire rack prior to frying. Once oil is at temp, fry the tomato slices about 8 slices if you’re using a 12-inch pan. Flip once the bottom is golden brown. Remove drain on paper towels. Reseason immediately with some SYD Hot rub. This should be done when hot. Let the tomatoes air so the crust stays crispy. Serve immediately. Place garlic into saucepan. Turn on low heat. Add 2 tablespoons olive oil. Remove and set aside garlic once they are cooked but before they turn brown and bitter. You can strain the sauce before using it or serve it unstrained. I prefer unstrained. 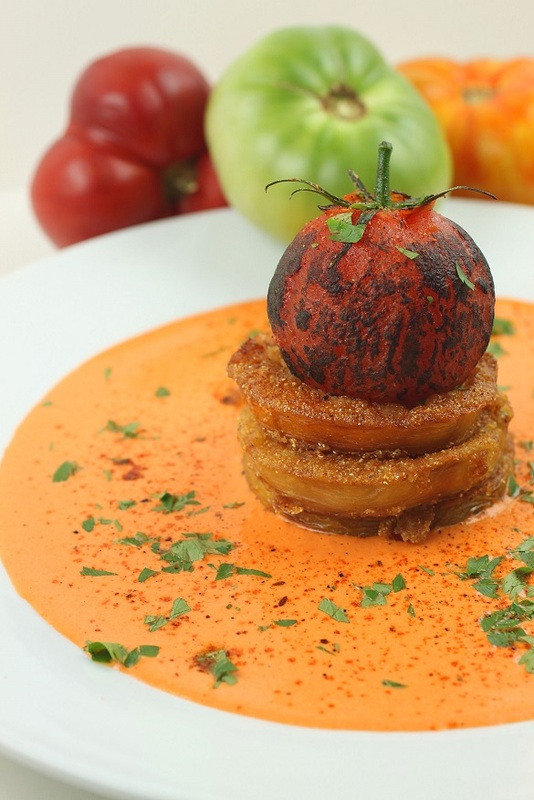 For a dramatic presentation, save some of the tomatoes you blanched and peeled, and use a propane torch to char it to top the fried green tomatoes. Garnish with chopped basil.